We do not have the statistics to prove the statement, but it stands to reason that there are as many Frenchmen marrying British women as there are Britishers marrying French women, and as many German men marrying Italian women as there are Italian men marrying German women. But in China, the same rule does not apply, perhaps in ninety percent of the cases, Chinese men marry foreign women and in only ten percent of the cases, do we find Chinese women marrying foreign men. Intending only to 'arouse some discussion on a point which have [has] been in the mind of many Chinese', this article speaks neither against nor in favour of mixed marriages. We who are fortunate enough to be in daily contact with this 'civilizing' influence are so obsessed with by the wonderful accomplishments of our press, that we lose all mental balance and can not see things in their proper perspective. But in our sober moments, when we are less enthused over our own merits and see ourselves as others see us, our preeminent position as a city of journalists at once dwindles into insignificance. Thus viewed, Shanghai not only fails to live up to its reputation as the centre from which all news emanates, but its very claim to a seat in the journalists' fraternity may even be questioned. Chen contends that the Shanghai press fails in what should be its two principle duties: 'the supply of accurate information'; and, 'the formation and guidance of public opinion'. He cites several recent examples of what he perceives to be erroneous or misinformed reporting. The following week, Lin Yutang published 'My Experience Reading A Chinese Daily' in response. To solve China's racial problem or the problems of her livelihood through birth control may be likened to the effort of a man who refuses to work to increase his income but prefers to add to it by denying himself the necessities of life… . To life her people out of a rut, so to speak, China has to promote and develop her home industries which, once firmly established, will open the door of employment to her teeming millions the majority of whom are without dependable means of livelihood. To safeguard against misuse and abuse, some such principle governing the dissemination of contraceptive information is absolutely indispensable. The detail as to the application of this principle is yet to be worked out. We may anticipate wrongly, but we do hope that the principle will not mean the meting out of contraceptive knowledge only to selected classes of individuals or families, and the withholding of it from others… . In short, a rational and effective clinical service in birth control must go hand in hand with a sound system of eugenic education. We do not mean to say that we are going to bark louder, but let us bark more humanely. After all a man can be quite a human being when he takes off his dog collar and his stiff shirt, and comes back home sprawling on the hearth-rug with a real relief. In our unbuttoned moods we shall speak. 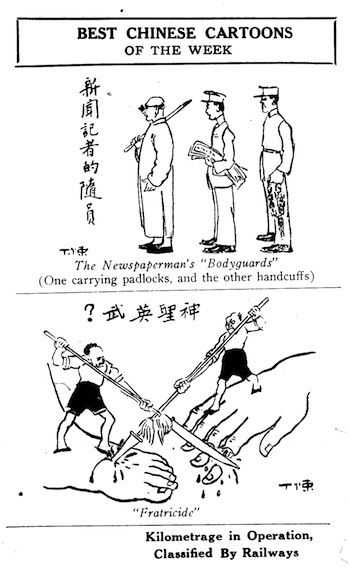 This first 'Little Critic' essay featured two political cartoons from Chinese newspapers. 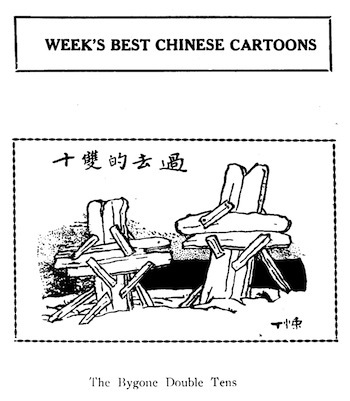 Henceforth, 'Week's Best Chinese Cartoons' became a weekly feature, unfortunately only until November this year. Selected from contemporary Chinese periodicals, they often reflected the events discussed in the pages of The Critic. T.K. Chuan's article 'The Terrible City' takes its title from a line in Jules Massenet's opera Thaïs, in which the protagonist Athanaël, a Christian monk, attempts to convert an Alexandrian courtesan (Thaïs) to Christianity only to find himself descending into lust for this woman, whose heart, in the end, is shown to be more pure that his own. 'Voila donc la terrible cité! ', exclaims Athanaël as he approaches the gates of hedonistic Alexandria. Indeed like another Athanael, we too wish to sing a hymn of hate and condemnation with however this difference: Athanael hated Alexandria for her science, her gentleness and her beauty; but we hate Shanghai for her ignorance, her unmanneredliness and her lack of beauty… . Civilizations rise and fail, Empires wax and wane, perhaps only in voluminous treaties written by learned doctors and paranoiac prophets, but this much we are such: Shanghai is a terrible city! In 'The Little Critic' this week, Lin Yutang offers his own perspective on Shanghai hedonism: 'Mr. Chuan might have spared his historical learning in proving his these [thesis]: a glance ot [at] the stupid and vulgar faces gather at a Majestic tea-dance would convince anybody'. Lin presents his 'Hymn to the Great Terrible City'. The nineteenth anniversary of the Xihai Revolution 辛亥革命 this year coincides with the end to hostilities between the forces of Chiang Kai-shek and the notorious 'Northern Coalition' of the warlords Yan Xishan 閻錫山 and Feng Yuxiang 馮玉祥. The China Critic responds with a mixture of optimism and critical reflection. 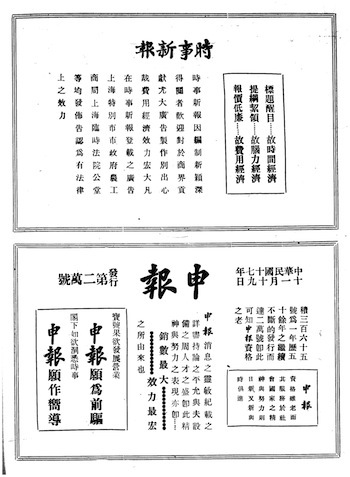 The Editorial 'General Chiang on Post-War Problems' reports that: 'The war in the North has happily concluded with the anniversary celebration of the Republic on October 10th'. It goes on to enumerate a number of tasks confronting the Kuomintang, which Chiang himself outlined in an anniversary manifesto. These include: 'the complete eradication of communism and banditry'; 'lethargy and inefficiency'; and, systemic corruption within Kuomintang officialdom. Another essay, 'The Chinese Republic Enters her Twentieth Year', provides a year-by-year account of important events in first two decades of the Republic. 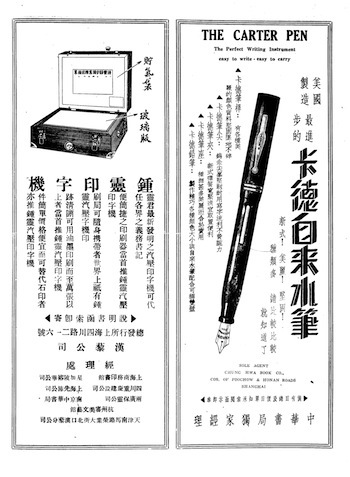 In consonance with our policy of trying to establish and foster a tradition of liberal thought in China, the editors of The China Critic have always felt the desirability of having such a club established, a club of men who can think, or a willing to make an effort to think, over and above the merely nationalistic lines. A huge question, therefore, hangs over Hollywood: is it going to enlighten the world with the blessings of modern civilization and human progress? or, on the contrary, as some pictures are now doing, poison humanity with ideas of mutual hatred and suspicion? It is a question which ought to interest not only those people habitually misrepresented in American films, but also all those who desire better international understanding and cooperation.